Getting the most from every grass cutting requires reliable, high performance tools. The NEW Rotary Disc Mower 8ft 6 Disc Slasher FIDM250 swiftly handle tough conditions — even wet or downed crops while delivering clean cutting performance, maneuverability, durability and value for money. A smooth ride, clean cut, superior trailing ability and narrow transport width, plus easy tractor hookup using a simple clevis hitch. Two High-quality, reversible knives per disc on six oval cutting discs. Rock guards and skid shoes to protect discs and carry the cutterbar over uneven ground. 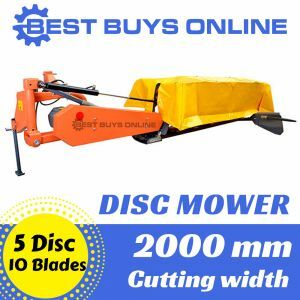 We also have the Rotary Disc Mower 7ft 5 Disc Slasher, 2m cutting width at discounted price.